We will be celebrating Christmas with a party this year. I had a very ambitious plan of preparing some homemade door gifts and googled for some interesting Christmas bakes. As I tried out some of the recipes, I realized that time is not on my side and the thought of baking a few different offerings as door gifts for a hundred guests proved too daunting. So as a compromise, I decided to make just enough to be eaten at the party itself and gave up the idea of having them as door gifts. This is one of the recipes that I had fun with – both because of the new experience of using royal icing (something I loved as a young girl) as well as the pretty colours. Royal icing can be made using egg whites or meringue powder. Due to the risk of salmonella poisoning, I chose to use meringue powder instead. If you difficulty getting your hands on a can of meringue powder, you can search for a recipe using egg whites instead. I had no idea of the huge variety of food colouring that was available till I stepped into Phoon Huat. There were bottles of liquid food colours, tubes of both white and coloured gel pastes. On top of that, there were the various sizes of icing nibs, squeeze bottles, icing bags and icing in ready-to-use disposable tubes. It was really fun icing the cookies but if you plan not to frost the baked cookies, you may like to sprinkle the unbaked cookies with crystal or sparkling sugar before popping them into the oven. 1) In a separate bowl whisk together the flour, salt and baking powder. Set aside. 2) Beat butter and sugar until light and fluffy (about 3 to 4 minutes). 3) Add eggs and vanilla extract, and beat until combined. Add the flour mixture and beat until a smooth dough is formed. 4) Divide the dough into smaller portions, wrap each portion in plastic wrap and put into refrigerator. Refrigerate overnight or until firm enough to roll. 5) Preheat oven to 350 degrees F (or 170o C) and place rack in center of oven. 6) Remove one portion of chilled dough from the refrigerator. On a lightly floured surface, roll the dough to a thickness of ¼ inch (1 cm). 7) Cut out desired shapes using a lightly floured cookie cutter and transfer cookies to a baking tray, lined with baking sheet. Place the tray of unbaked cookies in the refrigerator for 15 min to chill the dough to prevent the cookies from spreading and losing their shape while baking. 8) Bake cookies for about 10 min (depending on size) or until they are brown around the edges. Remove from oven and leave to cool on baking tray for a few minutes before transferring to a wire rack to finish cooling. 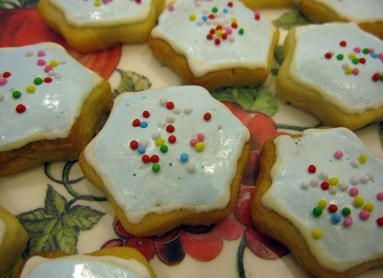 9) When cookies are completed cool, frost with royal icing, if desired. Be sure to let the royal icing dry completely before storing in an airtight container between layers of parchment paper or wax paper. 1) Beat the confectioners' sugar and meringue powder until combined. 2) Add water a little at a time to get the right consistency and beat on medium to high speed until very glossy and stiff peaks form (5 to 7 minutes). 3) Separate the icing into as many portions as required for different colours and/or consistencies. For out-lining, the proper consistency should be glossy with stiff peaks. For covering or 'flooding' the entire surface of the cookie with icing, the proper consistency is when you lift the beater, the ribbon of icing that falls back into the bowl remains on the surface of the icing for a few seconds before disappearing. 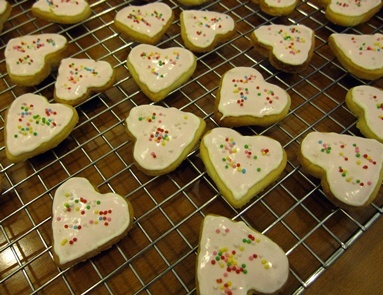 4) Add food colouring to the royal icing to obtain desired colour. Use a toothpick and add minute amounts at a time, a little goes a long way. 6) After frosting, add further decorations if desired. 7) The icing needs to be used immediately or transferred to an airtight container as royal icing hardens when exposed to air. Cover with plastic wrap when not in use.